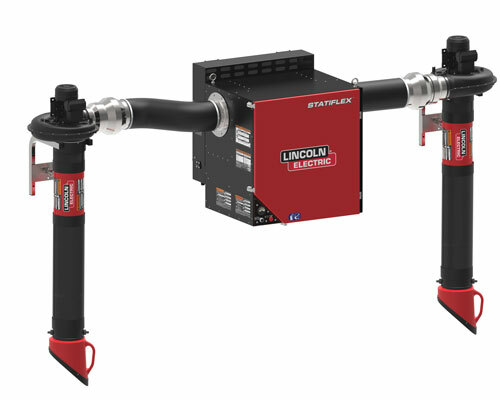 Lincoln Electric’s new Statiflex 800, a wall-mounted weld-fume extraction and filtration system, is designed to curtail operating costs via self-cleaning filtration that reduces the frequency of filter replacement. The system features dual-arm capacity that includes an optional extended reach of 27 ft. The system reportedly is ideal for heavy-duty extraction and filtration in facilities with fixed workstations and limited floor space. To aid with efficiency and cost, the onboard automatic filter-cleaning mechanism uses blasts of compressed air to knock particulate from the filter surface, extending the time interval between filter replacement. Statiflex users can create a configuration tailored to individual needs—start with the base unit and choose an extraction arm, wall-mounting hardware, starting control, fan and (where applicable) an extension crane mounting.